Property Size 1,051 sq. ft.
Great location! This three bedroom condo is at Purgatory Resort and about a one-block walk to the ski lift and the main Plaza where you will find shops, restaurants ski rentals and more. 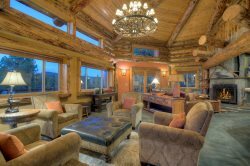 The condo is a member-home of the Durango Mountain Club, where guests can enjoy use of the swimming pool, hot tub and fitness center at the ski area base. Information on how to access the DMC amenities is provided to guests at time of check-in. The three bedroom, two bath condo is on the upper level with windows and balcony facing to the East, creating a panoramic view of the high mountains surrounding the ski area. Bedrooms include a master suite with king bed and private full bath, a second bedroom with queen size bed, and bedroom 3, which includes two twin beds. The second bath is a full bath with updated tile and fixtures. The living area consists of a living room with wood burning fireplace and balcony, a large dining nook that easily seats six people with more seating at the open kitchen counter, and an updated galley-style kitchen with new appliances and granite countertops. Winter visitors will be in walking distance to the main ski runs at Purgatory while still finding themselves in a quiet condo ‘neighborhood’ with easy access and 24 hour check-in availability. In summer, there is an abundance of hiking, biking and 4x4 trails in and near the resort, as well as in the San Juan Mountains which surround the resort area. Motorcycle enthusiasts will encounter completely paved roads and parking to and from the paved San Juan Scenic Byway, which offers a popular scenic drive for motorists of all kinds. Serious road cyclists with find the paved highway north to Silverton or south to Durango to be scenic and challenging routes. Mountain bikers have many choices of trails that allow bikes, and hikers are minutes from a vast array of high mountain hikes. Comfortable place. Perfect location. Well described. Parking was tough, especially when there is snow.